LONG DAY’S JOURNEY INTO NIGHT is the pain-filled, exhausting, sometimes tedious, often brilliant 1962 transfer to film of what is regarded as one of the Great American Plays: Eugene O’Neill’s semi-autobiographical story of tension and torment among a family of four. Years of denial and bile erupt over the course of one day, chiefly in a few rooms of the family’s Connecticut home, summer of 1912. What a quartet: the mother (Katherine Hepburn) is addicted to morphine, floating between a childlike dreamy unreality and a wasted, deluded aversion to the facts of the dilemmas that surround and consume her; the father (Ralph Richardson) lives on his past glory as a stage actor, his squandering of the family fortune in ill-advised speculation exceeded only by his stinginess with a dollar as applied to his loved ones; the older son (Jason Robards) is a whoremongering alcoholic, alternately bitter and boisterous; the younger brother (Dean Stockwell) is a sensitive poet wracked by tuberculosis. Blame flies in every direction, with the communal self-destruction all the more searing due to the love they still feel for each other, trampled and soiled as it is. 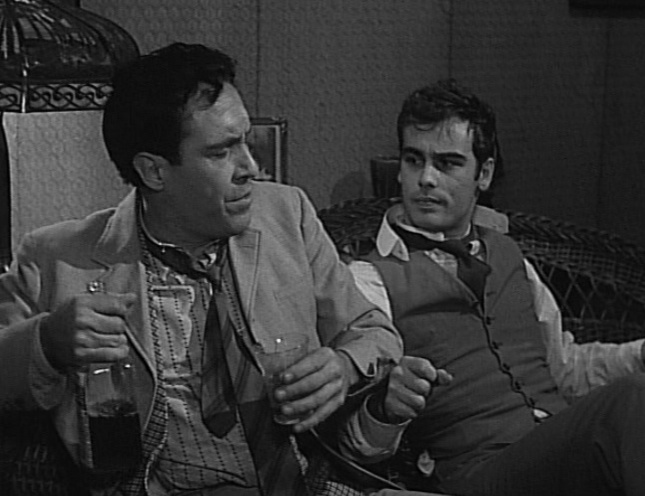 Scene after scene these wounded spirits flail each other alive: it’s an actor’s bonanza. 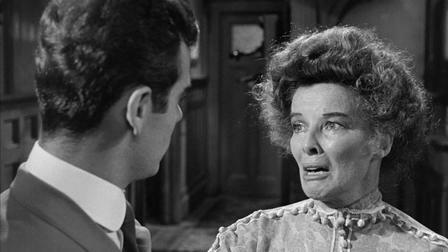 Hepburn’s delirious, spacey mother takes center stage for the first half, then the men get to unleash their broadsides. 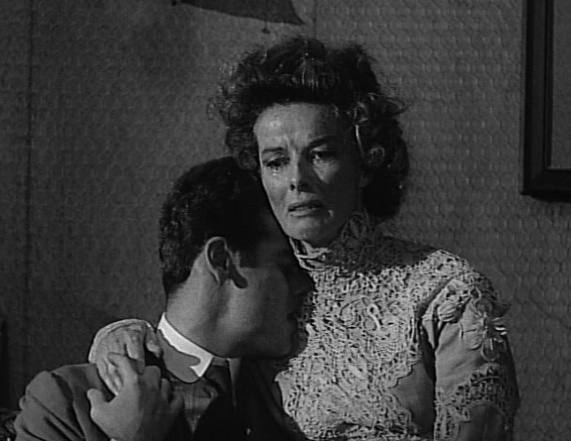 She was nominated for Best Actress (lost to Anne Bancroft for The Miracle Worker), and it’s quite a tour de force. It takes some adjustment time for the viewer, because of the innate theatricality of both character and actress, but just when you think she’s gone a gesture too far she pulls out with something that approaches astounding. Richardson has the best movie role of his career, every line an emerald. 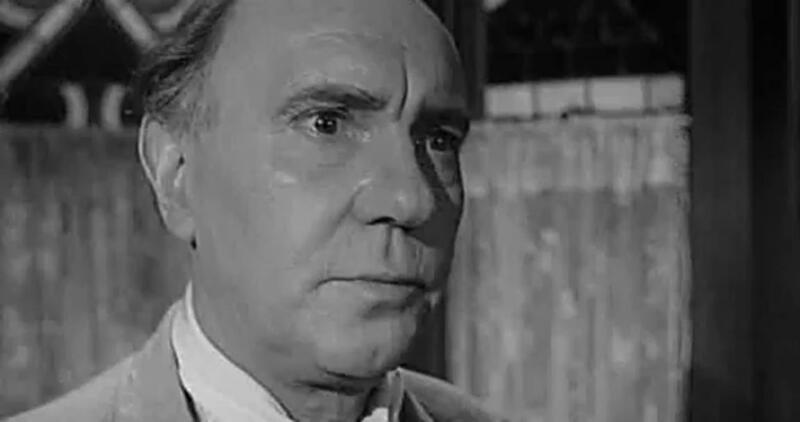 Robards’ plays it a little stage-big, I think, while Stockwell has maybe the hardest part to score in, shadowed by the flamboyance of the other three. Sidney Lumet directed, with excellent black & white camerawork from Boris Kaufman. What works against complete success is that there’s just too much of it, too many repetitions of the same arguments–along with the merciless tone– kind of numb you out. O’Neill packs so much in that at the start of a paragraph a character is seething with anger and at the end they are stricken with forgiveness. Count the number of “Oh, for God’s sake, papa!” variations. Each scene is masterfully realized, but not really much different from the one preceding it. The original 174 minutes were chopped by 38, which alleviated some overkill; alas some of Robards’ best scenes were cut. It’s not something to watch if you’re in a buoyant mood (still not quite as overloaded as The Iceman Cometh ). Niggling about excessive verbiage in what’s long been regarded a theatrical Titan may skirt blasphemy, but any way you cut it this cinematic rendering of O’Neill’s agonies ought to be seen for its historical value alone, and it’s a must if you appreciate superb actors exorcising their craft to the hilt. With Jeanne Barr as the dumb-cluck maid—an odd choice from Lumet–she’s annoying as heck. Cogerson lists its boxo-office gross at $2,200,000.